My last article about thorium as an alternative nuclear reactor fuel drew way more readers than I expected. I intentionally glossed over the complexities of specific reactor designs for the sake of simplicity, but in this article I want to go deeper. This article explains some of the differences between traditional uranium reactors and molten salt thorium reactors (MSRs). Traditional uranium reactors are by far the most common type of reactor around the world. This includes all 359 Light Water Reactors and 31 Heavy Water Reactors in operation today. These reactors use a solid uranium fuel loaded into fuel rods, moderated by water. So, why should we care about this practically forgotten molten salt reactor? Well, because (1) the claims about these reactors turn heads: “they can safely power all of human civilization for millenia without significant waste” [Sorenson], and (2) there is a body of research to support these claims, with active research programs in China and Japan, and a retired program in the US. You have to wonder what’s stopping us from tapping this supposed panacea of energy, and a dose of skepticism for these claims can only be healthy. What are the technical difficulties? To find out, we need to compare traditional uranium reactors and molten salt reactors in two of the most cost-sensitive areas: safety and waste. Our main safety goal is to avoid nuclear core meltdown or other damage to the reactor core that can release radioactive materials into the environment. The three most infamous core meltdowns are Three Mile Island (USA 1979), Chernobyl (USSR 1986) and Fukushima I (Japan 2011). All three were traditional uranium reactors – what caused their failure? 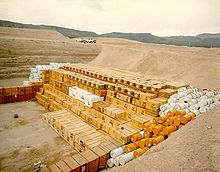 In traditional uranium reactors, uranium fuel pellets clad in zirconium are loaded into fuel rods, and many fuel rods are loaded into the reactor core. Diagram of fuel pellets, assembled fuel rods, and reactor vessel in a CANDU pressurized heavy water reactor; courtesy of AECL. If the reactor temperature isn’t carefully controlled, any of these components can melt: the fuel rods, zirconium pellet cladding, or the uranium itself. This screws up the structure of the core, and makes it even harder to control. This can lead to total disaster if not carefully managed by humans. In most modern reactors, the core is shut down by control rods in 3-5 seconds (fission stops), but the core still contains lots of highly-radioactive fission products, and the decay heat from these products requires continuous cooling for weeks even after core shutdown. That cooling process also must be human managed and actively powered. Nuclear reactors are operated under extremely stringent requirements, and the above examples in no way show that civilian nuclear reactors are a bad idea or are mismanaged. The main point is that careful human management and tending of traditional uranium reactors is required in order to prevent a nuclear meltdown. Only in unusual circumstances do they fail. But, they do fail. So what about Molten Salt Reactors? 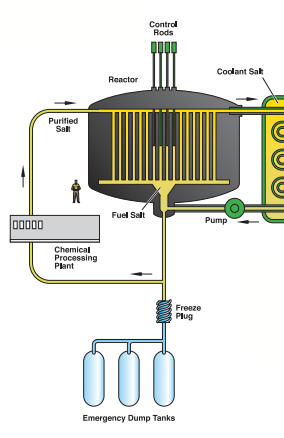 Diagram of a molten salt reactor courtesy of the US DOE Generation IV Roadmap. The team at Oak Ridge also discovered that they could continuously re-process the molten salt to remove fission products like xenon-135, preventing complex transients like at Chernobyl. Even better, they discovered that the molten salt in the core of the reactor had a very high boiling point (around 1400-1700°C) which meant that the molten salt would be much less likely to enter a gaseous state during a crisis. Without a gaseous state, the reactor vessel wouldn’t reach high pressure even if the freeze plug failed to melt, so you wouldn’t see secondary explosions either. The reactor vessel on the MSRE was made of Hastelloy-N, an advanced nickel alloy designed specifically for use with molten fluoride salts. But over the course of several years it became apparent that the alloy was being chemically eroded by (a) chromium leaching from the Hastelloy-N into the molten salt, and (b) tellurium (a fission product) causing embrittlement in the Hastelloy-N reactor vessel walls. The graphite moderator, used to slow neutrons down to “thermal speeds” in the core, had severe swelling and radiation damage after four years. Tritium (a radioactive isotope of hydrogen) was discovered in the secondary coolant loop. In a larger reactor this would pose a radioactive release concern. They discovered that slight adjustments to the chemistry of the molten salt (adding beryllium) would prevent the tellurium-cracking and chromium-leaching. Alternatively, newer research has shown that adding a small amount of niobium or titanium to the Hastelloy-N metal can also prevent both issues. The graphite moderator can be replaced every four years. Or, much more compelling, the concentration of thorium/uranium/plutonium/actinide fuel can be adjusted to make the MSR a “fast neutron reactor” that doesn’t need the graphite moderator at all. If the primary coolant loop runs on a second molten salt, its chemistry can be made to absorb tritium, preventing the tritium from ever reaching the environment. So to be quite honest, the original MSRE team at Oak Ridge seems to have figured out the real problems, fixed them, and operated their reactor quite successfully for four years before funding was cut. They even built and validated the freeze plug + drain tanks, and the xenon-135 removal process. Of course there are problems that can’t be foreseen when put into production with hundreds of reactors, but these main issues are (happily) already resolved. Great, what about Radioactive Waste? Radioactive waste comes in several different forms, and each is handled differently. Uranium fuel gets fissioned in the core, but in a traditional uranium reactor 98% or more is left unburned. The remaining fuel is very long-lived, in the millions or billions of years, and is therefore only slightly radioactive. Fission products like cesium-137, strontium-90 have much smaller nuclei and are much less stable. They all have half lives less than 90 years, and are intensely radioactive. The two key points for a traditional uranium reactor are (a) only a tiny percentage of the uranium fuel is actually used and (b) the actinide waste is by far the most annoying part of the waste stream. The mind-blowing thing is that these are the two areas where molten salt reactors appear to excel. A “fast breeder” version of a molten salt reactor has fast neutrons in the reactor core. These neutrons easily interact with the actinides, transmuting them into fissile isotopes and then fissioning them to produce energy. In other words, molten salt reactors burn actinides. The same is not true for traditional uranium reactors because they have thermal (slow-moving) neutrons in the reactor core. Neutrons at these slower speeds don’t interact with the actinides, so you can’t burn actinides in a traditional uranium reactor. So from the perspective of waste production, molten salt reactors appear to be the obvious winner. In fact, molten salt reactors are often called “actinide burners” because they would allow us to get rid of old actinide waste from traditional uranium reactors. The biggest costs for nuclear reactors are safety systems and proper handling of the waste stream. As best I can tell, molten salt fast breeder reactors are significantly better than traditional uranium reactors in both of these categories. As a side note, it looks like using thorium as a fuel is not actually critical. Thorium can be used as fuel in molten salt fast breeder reactor, which is a benefit for long-term sustainability, but thorium has little relation to the cost of constructing a new reactor today.